LEGO has announced that the Palace Cinema set is retiring. The Palace Cinema is a part of the Modular Buildings series which has been around for ten years. The series focuses on large, detailed buildings that can be connected to create stunning streets in the LEGO world. Palace Cinema was one of the best in this series, presenting a beautiful street corner movie theater complete with marquee, movie posters, sidewalk stars, and, most notably, a gorgeous “Palace” sign on the front of the building. Inside the building is a concession stand and small theater area where the movie of the day is playing. 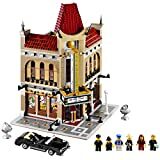 If you are a fan of the Modular Buildings series, or just really well designed, fantastic looking LEGO sets in general, you will want to act fast as grab Palace Cinema before it plays its last show. It’s premiere night at the Palace Cinema! Illuminate the night sky with the spotlights as the child star arrives in a fancy black limousine! Gather the crowd on the star-studded sidewalk, then head into the detailed lobby with a concession stand and ticket area! Take the grand staircase into the theater with a large screen, movie projector and reclining chairs for 6 minifigures. Introducing the latest addition to the LEGO® Modular Buildings series, the highly detailed, 2-story Palace Cinema corner building. This collectible model features a sidewalk of the stars, brick-built entrance doors, posters, sign frontage, a tower with spires and rooftop decorations. Includes 6 minifigures: child actress, chauffeur, female guest, male guest, photographer and cinema worker. Collect and build an entire town with the LEGO® Modular Buildings collection: 10224 Town Hall, 10218 Pet Shop and 10211 Grand Emporium!